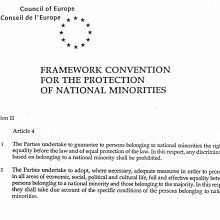 On the initiative of the Council of Europe, a Framework Convention for the Protection of National Minorities was signed in Strasbourg on 1 February 1995; it sets out the rights of members of minorities. For the German Sinti and Roma, the Central Council was able to obtain their legal recognition as a national minority in May 1995, and German Romani was recognised as a minority language in accordance with the European Charter for Regional or Minority Languages. The status as a national minority guarantees protection against discrimination and promises active support designed to enable greater participation in society as well as involvement in the political process. However, a gaping abyss separates the protection of minorities as it is enshrined in the legislation and its social practice in many countries. Countries like Bulgaria, Romania, Hungary and Slovakia have all ratified the Framework Convention, even though discrimination against Roma minorities is part of everyday life in these countries.